Dr Bernie C Byrnes is currently a Senior Research Fellow at the University of Portsmouth. She is an established theatrical practitioner, a Fellow of the Royal Society of Arts and a member of the Guild of Directors. 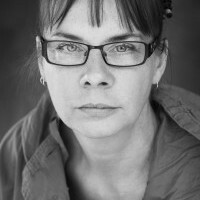 She has staged work nationally and internationally including projects at The Globe and with the RSC. Bernie is an award-winning writer/director/dramaturg. She has a PhD in Literary Criticism with a widely published academic porfolio. She also regularly lectures at the universities of Portsmouth and Chichester. PONToon is an exciting project that uses a range of new and developing technologies such as games development, 3D/virtual reality, social media and web/mobile apps to engage, support and up-skill women in order to aid their employment opportunities. The project is centred around community development, social and economic inclusion and equality. It aims to produce a method of working that's not only scalable and transferrable but also applicable to broader demographic sets and geographical regions for continuing impact. Ideas about how to provide engaging ways of teaching women how to use technology such as games development and 3D/virtual reality technology. Ideas for creating a range of new and developing technologies to engage, support and up-skill women in order to aid their employment opportunities. Ideas about how gamification techniques can foster community development, social and economic inclusion and equality.